Sawmills must submit monthly reports detailing their purchase of timber right up to the point of export as part of Sarawak’s enhanced measures to stamp out illegal logging and timber smuggling. The Star’s Sharon Ling reports. Announcing the tougher requirements, Chief Minister Tan Sri Adenan Satem warned that sawmills must not accept timber from illegal sources or risk losing their licences. “They are to submit monthly reports on their purchase of timber from all sources. “They are to tell the Forest Depart­ment and other authorities the route the timber takes from the point of felling to the point of export, if any, or to the point of processing,” he said. He said enforcement officers from the Forest Department and Sarawak Forestry Corporation (SFC) must familiarise themselves with the details of timber concessions in their areas. “They must know the boundary, the licensee, contractor, subcontractors and location of log ponds. “They must make regular but unscheduled visits to sawmills and to these areas,” he told reporters after handing over 29 four-wheel drive vehicles to the Forest Depart­ment here yesterday. 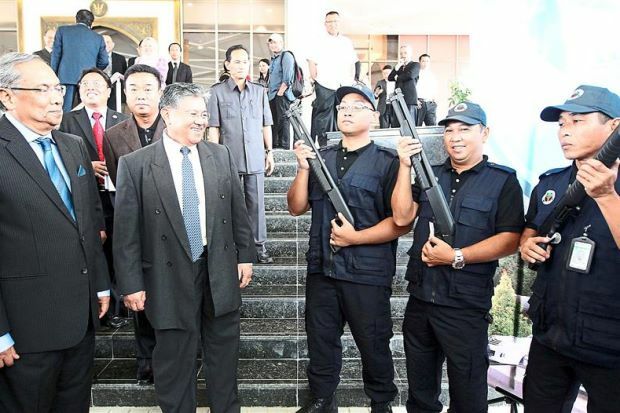 Fifty pump-action shotguns were also issued to forest enforcement personnel. “With these extra facilities, I expect that they will be more effective in enforcing the Forest Ordinance. I do not want any more excuses from the Forest Department or SFC that there is not enough manpower or facilities,” Adenan said. He said efforts would be made to isolate and prosecute informers in the Forest Department and SFC who tip off illegal loggers and smugglers about raids. Adenan said the state had achieved some success against illegal logging and smuggling since announcing a crackdown a few months ago. Last year, the Forest Department seized 82,327 cubic metres of logs worth RM41mil, an increase of 634% compared to 2013 seizure of 11,216 cubic metres worth RM5.6mil. “This means that we have been quite successful but we will keep at it. It also shows that this problem is more widespread than we think. “We carried out 210 raids last year and the figures will show a sudden jump since we declared war on illegal logging and smuggling,” Adenan said.